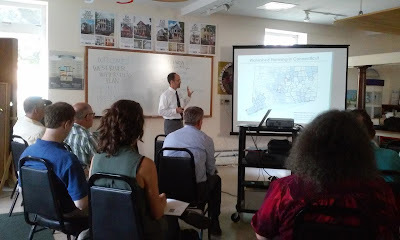 On Tuesday, August 18, NHS of New Haven was proud to host the West River Watershed Coalition, Save the Sound, and the environment engineers, Fuss & O'Neill, as they presented their draft of the West River Watershed Management Plan. 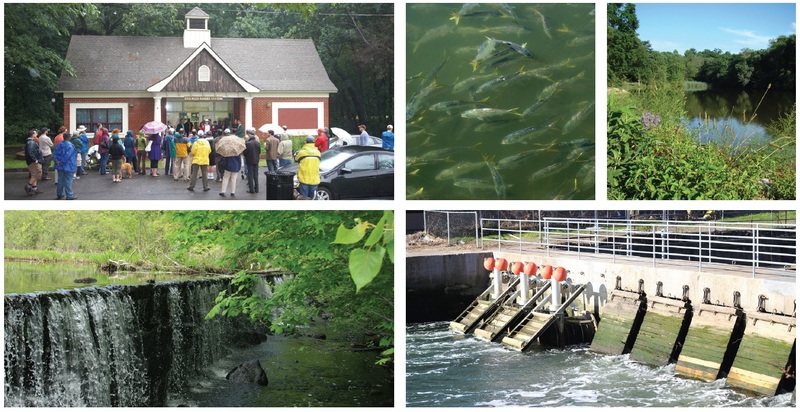 For close to a year, Save the Sound has been working on behalf of the West River Watershed Coalition to gather information about the ecological challenges that the West River faces, and what is needed to make its whole watershed healthier. The 25-mile long West River originates north of Lake Bethany near Route 42 and flows south through Bethany, Woodbridge, New Haven, and West Haven, eventually discharging into New Haven Harbor. Capacity Building -- strengthening and building local capacity to implement the watershed management plan. Water Quality -- improving the water quality of the impaired segments of the West River and its tributaries by reducing loadings of bacteria and other pollutants. Consistently meet water quality standards for creation and aquatic habitat. Protect and enhance high quality and unimpaired waterbodies. Habitat Protection and Restoration -- protect and restore terrestrial, streamside, and aquatic habitat. 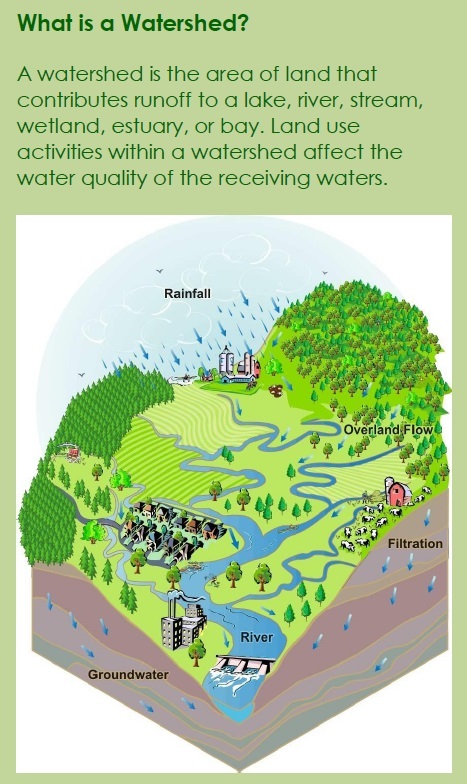 Sustainable Land Use and Open Space -- promote sustainable land use and appropriate development in the watershed while protecting and improving water quality and natural resources, enhancing public access to and connectivity of waterbodies and open space, and addressing current and future flooding problems. Education and Stewardship -- promote stewardship of the watershed through education and outreach, improved access to the West River and its tributaries, and citizen involvement in science, conservation, and restoration activities. If you would like to read the full West River Watershed Management Plan and/or offer any comments or suggestions, please contact Kendall Barbery, Green Infrastructure Program Manager, CFE/STS at kbarbery@savethesound.org by August 24th, 2015. 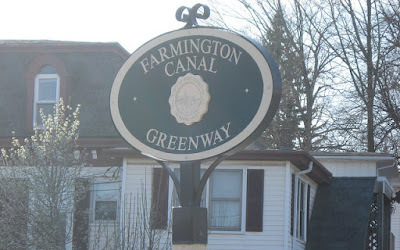 Exciting News for the Farmington Canal Greenway Trail! On Friday July 31st, the Community Building & Organizing team received exciting news – the City’s Department of Arts, Culture & Tourism will be awarding $750 to support our Farmington Canal Greenway Community Mural project! This grant award is provided through the Mayor’s Community Arts Grant Program. The Farmington Canal Greenway Community Mural is an initiative to install a new mural painting along the Farmington Canal Greenway trail in Newhallville. There are numerous benefits to public art, and with this mural we hope to affirm Newhallville as a healthy and welcoming neighborhood. The mural will depict runners utilizing the Greenway Trail, which we believe will raise awareness and interest in the trail as a means of healthy recreation and alternative transportation. Earlier this spring, we received our first financial contribution from the Awesome Foundation of Connecticut, and with this second award we can now move on to purchasing our painting supplies! The CB&O staff deeply appreciates the ongoing commitment of local artist Kwadwo Adae, who will be designing and developing the mural. With generous support from the Mayor’s Community Arts Grant Program and The Awesome Foundation, we are confident that we will produce a highly valuable art piece that can be shared and enjoyed by all of the residents of Newhallville! In the coming weeks, we will be asking residents to join us in painting Kwadwo’s design – stay tuned! News Conference Featuring NHS, Wells Fargo, and NeighborWorks America a Great Success! NEW HAVEN, Conn. – August 12, 2015 – Wells Fargo & Company, NeighborWorks America® and its network member Neighborhood Housing Services of New Haven today joined mayors of New Haven and West Haven, Conn. to announce a local program designed to boost homeownership in New Haven, West Haven and East Haven. Wells Fargo HomeLIFT℠ will provide $15,000 down payment assistance grants to help potential homebuyers overcome the barrier of making a sufficient down payment. 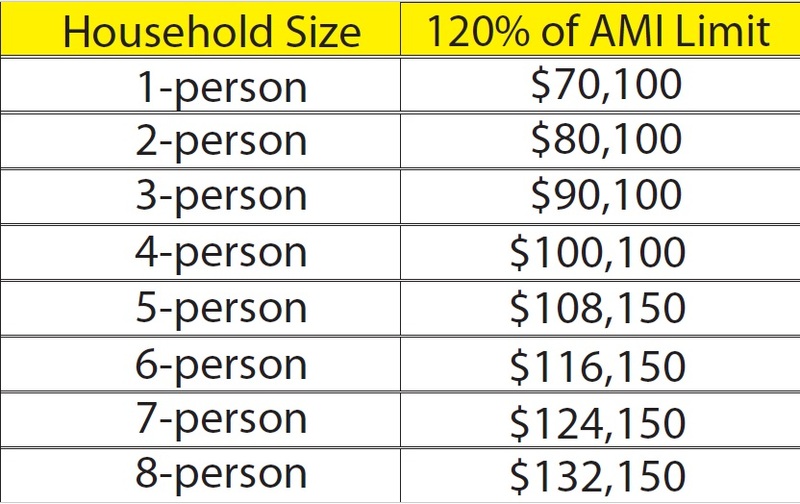 Down payment assistance grants of $15,000 will be available for eligible homebuyers with annual incomes that do not exceed 120 percent of the local area median income – which is about $100,100 for a family of four – with income maximums varying depending on family size and type of loan. To be eligible, homebuyers must meet specific criteria, such as completing an eight-hour homebuyer education session with Neighborhood Housing Services of New Haven, a HUD-approved counselor. In order to reserve a grant, homebuyers must register for the free HomeLIFTevent on August 28-29, from 10 a.m. to 7 p.m. at The Omni Hotel, located at 155 Temple Street in New Haven. The event also includes a Wells Fargo Affordable Home Tour® viewing center where attendees can preview local homes available for sale. 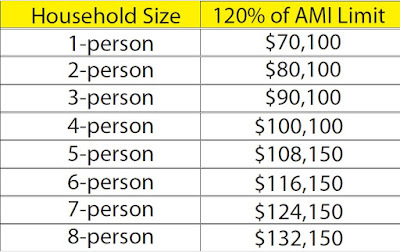 To reserve a grant, participants buying homes with HomeLIFT program down payment assistance grants must commit to live in the home for five years and qualify for a first mortgage on the property. The down payment assistance grants may also be used to buy a home that needs improvements with a new mortgage purchase 203k renovation loan. "This innovative public-private collaboration can be life-changing for our residents and our neighborhoods," added New Haven Mayor Toni Harp. "Programs like this HomeLIFT imitative will help more local homebuyers achieve their goal of owning a home while, in turn, making our local neighborhoods even stronger." Neighborhood Housing Services of New Haven will determine homebuyer eligibility and NeighborWorks network member, the Housing Development Fund will administer the down payment assistance grants. Approved homebuyers will have up to 60 days to finalize a contract to purchase a home in New Haven, East Haven or West Haven to receive a grant. We are ready to help families qualify for the Wells Fargo HomeLIFT program down payment assistance grants," said Jim Paley, Executive Director with Neighborhood Housing Services of New Haven. "Wells Fargo's investment will help individuals and families achieve the dream of owning a home and improve our New Haven, East Haven, and West Haven neighborhoods." PAVE New Haven VISTA members volunteer for a service project with NHS of New Haven. On August 10th the Community Building & Organizing (CB&O) team at NHS hosted 8 AmeriCorps VISTA members from PAVE New Haven. 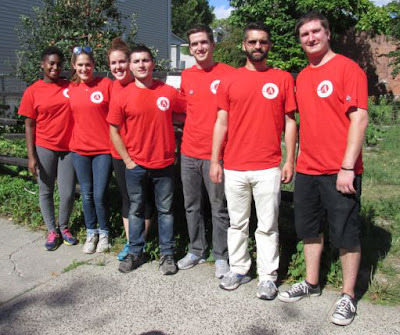 PAVE New Haven is a multi-site AmeriCorps VISTA - Volunteers in Service to America - project sponsored by the Agency on Aging of South Central Connecticut through the Corporation forNational & Community Service. The overall mission of PAVE New Haven is to increase student literacy, college readiness, and ensure that all New Haven students' and families' educational needs are met. 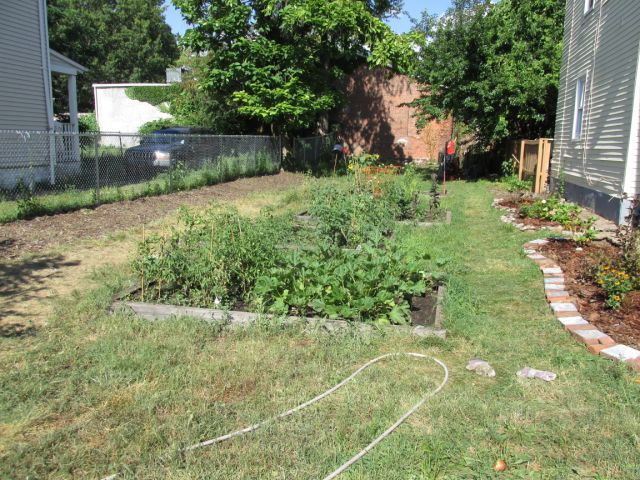 Though relatively small, our volunteers were very productive in accomplishing various tasks within and around our Stevens Street Community Garden. 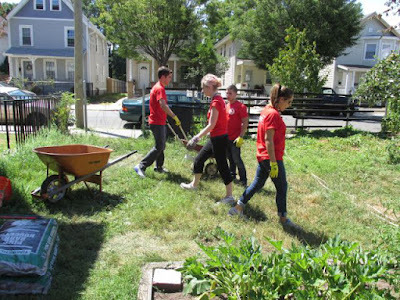 Volunteers spent a day in the garden, discussing the history of New Haven and its neighborhoods. NHS VISTA member, Hannah Wells, and former NHS VISTA member, Chandel Gibbs, were able to provide these volunteers with resources related to the VISTA experience -- offering guidance and advice. At the Stevens Street Garden, the volunteers moved compost, spread mulch, and pulled weeds along the fencing. 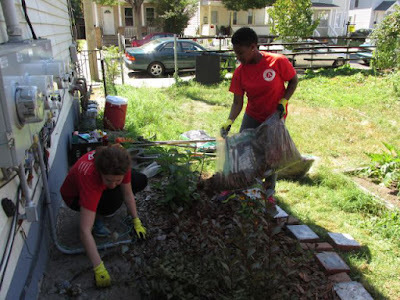 In addition, they organized the compost bins, spread new mulch, and watered the trees along the street. The volunteers were also fortunate enough to work alongside residents who live next door to the garden and speak with various community residents who were simply walking by. The day was very productive and successful, and a lot of work was accomplished in the garden. On behalf of the NHS’ CB&O team, we would like to thank the PAVE New Haven volunteers for their service, and wish them all a very productive and successful VISTA year.